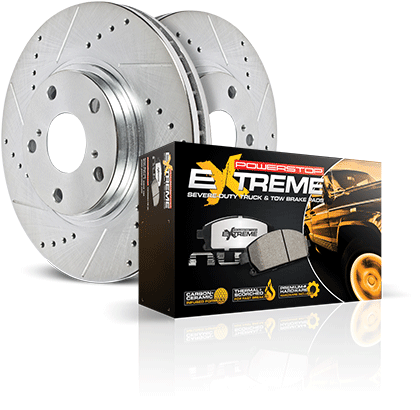 Noise-Free and Low-Dust Performance Upgrade Brake Kit for your Chevy truck! Perfectly matched rotors and pads along with upgraded stainless steel hardware, new pin bushings, and high-temperature brake lubricant. All Power Stop Brake kits are available for Front Axle, Rear Axle or Front & Rear Axle. provide Extreme stopping power without sacrificing every-day drivability. Say, "Goodbye" to that nasty brake dust! 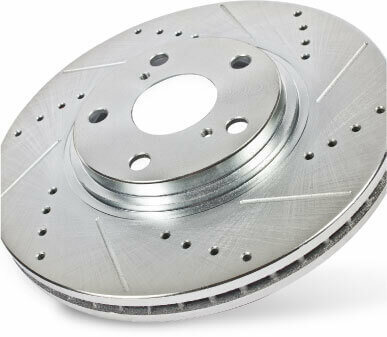 All Carbon-Fiber Ceramic brake pads feature a dust-free friction formula. No more embarrassing, noisy brakes! We test all street compound brake pads to ensure noise-free braking. Our Carbon-Fiber Ceramic formulas give you increased braking power without sacrificing everyday drivability. Power Stop rotors are cast using the finest G3000 metallurgy with strict OE tolerances – making them a perfect, bolt-on upgrade without the need to make any modifications. Precision drill holes allow for maximum rotor cooling. This keeps your brakes temperatures down during extreme operating conditions. Rounded slots help wipe away any gas or debris – keeping a clear contact patch on the rotor surface for safe, smooth braking. Silver Zinc Dichromate plating is applied to all drilled & slotted rotors (except for hub assemblies) to not only look great behind your wheels but to help prevent rust & corrosion.